Camping is all about reconnecting with the simple life in the outdoors. 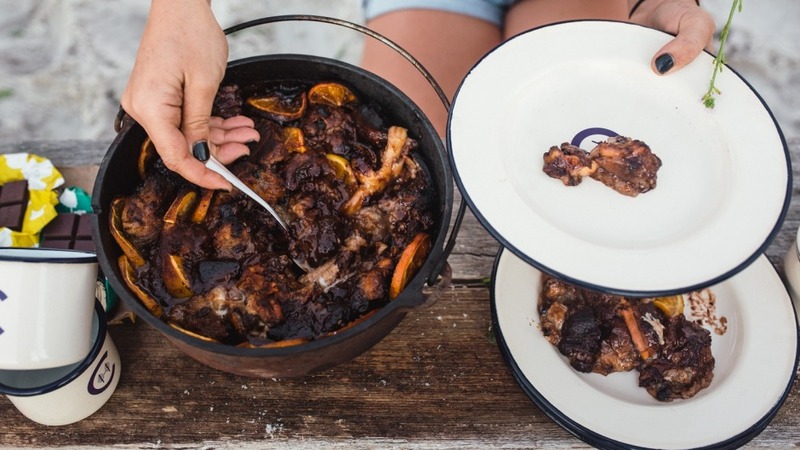 These camp cooking hacks are designed to help you make the most of your Easter long weekend. 1. Before you leave home, prepare pancake mix and pour it into a squeeze bottle or reused drink bottle. Keep it in the cooler box and bust it out for a breakfast treat (note: storage life for open eggs is two days). 2. Campfire cooking is deeply rewarding, but sometimes it's incredibly convenient to also have a gas stove to use. You can use the disposable butane-can variety, but for greater cost-efficiency and the least environmental impact, it's best to have an LPG bottle, regulator and stove. 3. On the campfire note, buy some leather welding gloves from any safety supply shop. These will protect your hands when using a grill or camp oven – no chance of dropping a pot holder or accidentally burning yourself with a wet tea towel. 4. A head torch changes cooking prep from inconvenient to a dream. Seriously. 5. Make an incredible baked cheese snack in your cast-iron camp oven, pot, or even tinfoil. Place a whole brie or camembert with liberal olive oil into your oven, and scatter over marinated kalamata olives and sweet paprika. Rest the pot or camp oven next to some coals – being careful to keep the heat low. 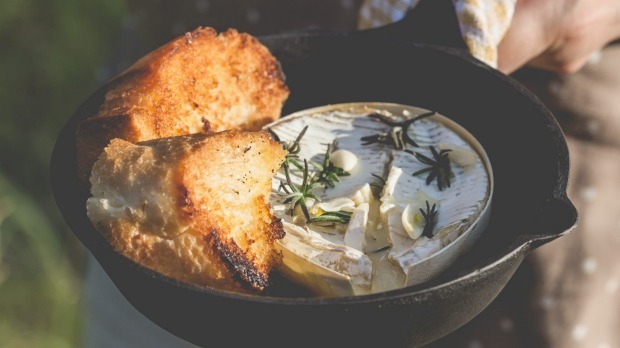 Check regularly until the brie has softened and is warm, and serve as an entree with biscuits, crusty bread or better yet – warm camp-made damper. 6. Forgot to pack the Aeropress or percolator? Pot-brew your coffee by adding one tablespoon of ground coffee per cup of water and simmer in a saucepan until a rich dark colour. Before serving, briefly splash some cold water into the mix – the coffee grounds will sink and you can pour your brew off the top. 7. When grilling meat or vegetables directly over the fire, drop some fresh herbs directly onto the coals to infuse your food. 8. Soak corn husks for 20 minutes and then throw directly onto the grill. They'll steam inside their wet husks, and bonus – won't burst into fire. 9. Had a few too many bush beverages? Make easy eggs and bacon: grab a recycled paper bag, line it with bacon strips and crack an egg or two into your bacon nest. Cook over your fire by sitting the bag on a grill or even by poking a stick through the top of the bag and supporting it so the stick sits horizontally between two forked sticks. Trust us – it really works. The bacon fat saves the bag from burning, but watch the bottom of the bag while eating for the same reason. 10. If you're camping at Easter, make a bread and butter pudding with leftover buns (see recipe below). Try stirring a tablespoon of custard powder into the mix before baking for a thicker pudding. This magical fairy dust is one of our camping dessert secret weapons. Alternatively, mix with water or milk to make a warm custard to serve alongside the pudding. Managed to stockpile a few extra hot cross buns at your Easter campsite? Try this simple dessert. It's best cooked over coals in a cast-iron Dutch oven, but if you're staying at home, you can also use a conventional oven at 180C for the same cooking time. 1. Light a campfire using lots of small sticks and twigs, and let it burn for about 30 minutes. You want to build up a nice base of coals that will sustain themselves for about 20 minutes. 2. Grease Dutch oven with butter or coconut oil and line with orange slices (the slices impart citrus flavour into your pudding while preventing sticking and burning). 3. Place torn buns or bread around the bottom of the dish. Mix together the milk and sugar or syrup. For extra pudding-like results, mix custard powder into milk (optional). Pour the milk over the bread, adding chocolate pieces in and around the buns. Finely chop the reserved orange peel and scatter throughout. Gently mix the pudding to combine and distribute the ingredients. 4. 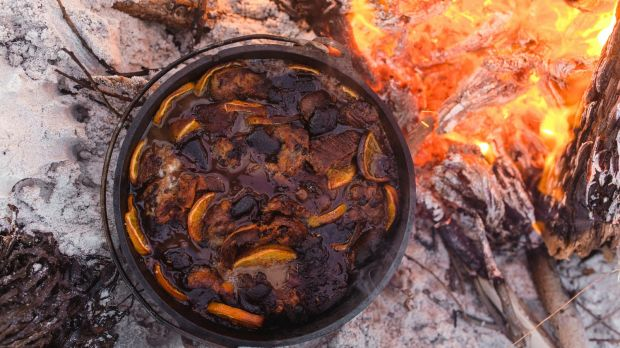 Pop the lid of the Dutch oven on and place onto a bed of coals directly next to the fire. Cook for about 15 to 20 minutes – but check regularly as timing on an open fire is variable. Rotate the oven every few minutes to ensure even cooking. Once most of the milk has soaked into the bread and the pudding looks more solid, it's ready. Rest for five minutes before serving.